Questions about Pedi PHAT? Call us at (515) 554-6132. ► About Pedi PHAT ► Orthosis Function ► Application ► Strength ► Evaluation guide ► Measuring guide ► Fitting guide ► Evaluating function ► ORDER NOW! The only carbon energy storing AFO. First, with the patient’s knee bent at 90 degrees, measure (in inches) from the Hamstrings to the floor. Second, measure from the posterior aspect of the heel to the proximal portion of the metatarsal heads. This should give you two measurements, ex. 14/6. The orthosis are measured the same way. Your patient measurements should be the same or greater then the orthosis measure, +\- 1/4 inch. © 2019 Bio-Mechanical Composites. Des Moines, IA. 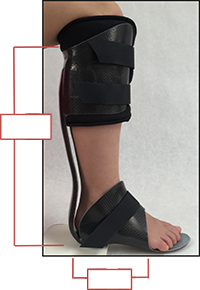 The brace height should be as high on the back of the lower leg as possible. The length of the lever arm of this part of the brace is key for the braces to function properly. In a sitting position, with the knee bent at 90 degrees. Measure the distance from the hamstrings (bottom of the thigh, just behind the knee) to the bottom of the heel (or the floor, just behind the heel). The height of the brace should be less then the height of the leg measurement. The brace is able to be cut down up to 1/4 inch, if necessary. The length of the foot section is measured from the back of the heel to the ball of the foot (not to the end of the toes). The measurement of the patient should not be more than 1/4 inch shorter or 1/2 inch longer than the length of the brace. Padding can be added if it will help to stay within these perimeters. If the prefabricated brace is not able to fit properly, it will not function properly for the patient. Evaluate the strength of each leg separately. Have the patient stand on one leg, the one you are testing. Stabilize the patient as necessary. Ask the patient to raise the heel off the ground, going up on to their toes and hold.... If the patient is not able to raise the heel off the floor or is only able to raise the heel a small bit off the floor. They would need a firm spring to match their strength deficit. If the patient is able to raise more than half way or all the way but not able to hold position. They would need a moderate strength to match their deficit. In cases of trying to control knee positioning ( hyper-extension, crouch gait, toe walking) a firm spring is recommended. In these cases the patient may have full strength (able to go up on their toes and hold position) during testing. In these cases, the firm strength of the spring is not replacing calf strength it is resisting it. As such a stronger strength is needed. In selection of a single (unilateral) right or left brace make sure the right selection is noted. In cases of both (bilateral) right and left braces it is found to be better for both braces to be of the same strength. Usually going to the firmer strength. This commonly provides a better overall symmetry in gait (walking). Use the button below to complete your order. You will be redirected to a third party payment portal. Please call (515) 554-6132 to order your product.